For those who haven’t seen this and for those who would like to see it again, the following link reports on Princeton resident Bernadette Kelleher, who volunteers at Ridgewood Lodge and the Princeton Legion. A very fitting and touching tribute to this wonderful lady. 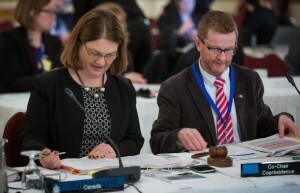 Federal Minister of Health Jane Philpott and BC Minister of Health Terry Lake at Vancouver meeting. Interior Health recently received notice from the owner of the building known locally as Arbor House that the building has been sold and the Anchorage Clubhouse used by various community support groups need to vacate by January 31, 2016. In an interview with local media held on January 12, Interior Health indicated that they are doing what they need to do to meet that deadline. In order to address the loss of the site, IH has reached out to community partners to seek out ways they can provide the Clubhouse services together. They “have no firm plans or agreements at this time.” More information is expected in the near future.